Fun games to learn to read from 3 to 7 years old. Free 22 games with 2 levels. Reading is one of the most important skills that can be taught in preschool and the first years of Elementary because it is the basis of everything that our little ones will make at school and in most of their adult life. or improve what they are already working at the school. 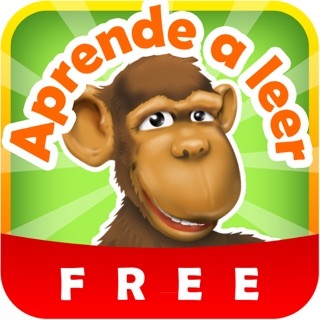 Learn to read Spanish with phonics is designed for kids from the age of 3 until 6 or 7 years old and even adults to improve pronunciation. This method is divided into 30 lessons, starting with vowels and continuing with L, M, S, T, P, N, D, F, H, C, Q, CH, G, GUE, R, -rr- - R, B, V, G, J, GE, GUE, Y, Z, CE, LL, X, K.
Each lesson contains 11 games, all available in two different levels. 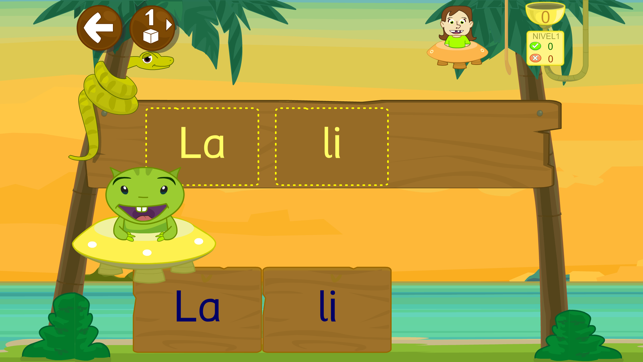 Ideal for parents and teachers looking for a way to practice and ask the kids the first syllables and words in Spanish. Encourage the child to listen and resolve the exercises; it is not necessary to understand everything. Learning to read is a long process, which can take more than one year. We recommend practicing a few minutes a day and from time to time back to what has already been learned and always adapting the type and level of exercise. It is very important to be perceived as a game. All games have 2 difficulty levels, which can be changed at any time. The child progresses at his own pace, you can interrupt the game and come back another time. As the games get resolved, the child obtains fruits. 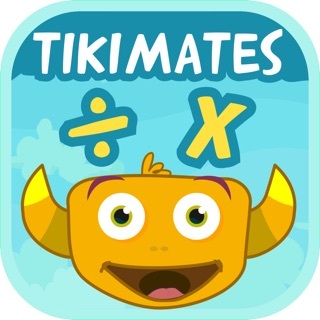 The first level is suitable for three years and in some cases even earlier with help from parents or educators. In games it can be solved with the help of the statement. The second level is more complex. We must invite them to work it out as they are able to do it, but always remember that learning is and must be fun. As parents or guardians, we recommend that the difficulty suits the child's abilities. In no event press excessively to complete the level or move to the next stage. - Change the font: uppercase, lowercase, and cursive handwriting. - Enable/Disable automatic activity: active means that after a number of exercises set, will automatically switch to another game. - Shuffle: rearrange the syllables. 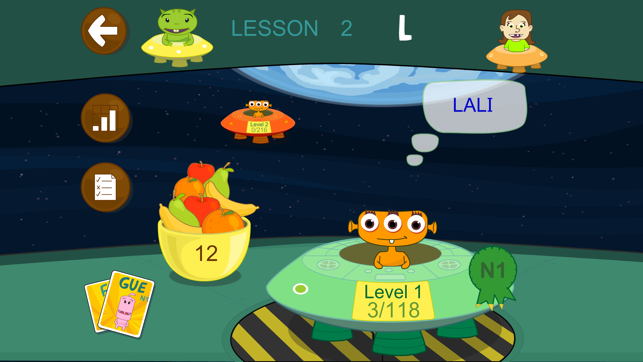 You can create up to three profiles (avatars) for different children and for each of them you can see the progress at each level as well as the rights and wrongs and the determined percentage of which is represented in the form of fruit. Fruits are a fun way to motivate kids to continue playing. When you have some in the basket, click on it to give them to the little aliens. If you want a more complete picture of progress press on the repotrs button at tikis screen. 1. DOLPHIN: Presentation of the word and its parts. 2. 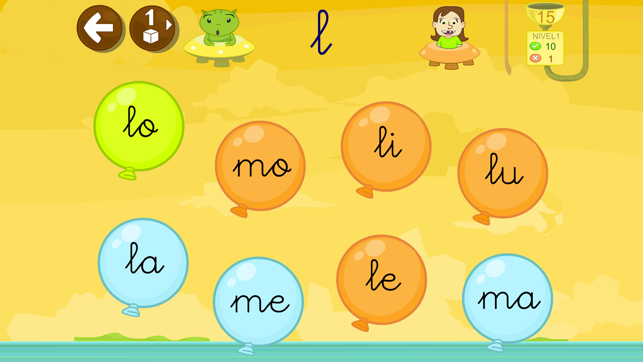 BALLOONS: Identification of the letters of the syllable. 3. CLOUDS: lace shape of each syllable. 4. CRABS: Formation of syllables from letters. 5. BUTTERFLIES: Identification of syllables. 6. BEES: Identification of the initial syllable of words. 7. SNAKE: Formation of words using syllables. 8. MONKEYS: Formation of words from letters. 9. PARROTS: recognition and word reading. 10. MOUSE: The order of the words and sentences reading. 11. 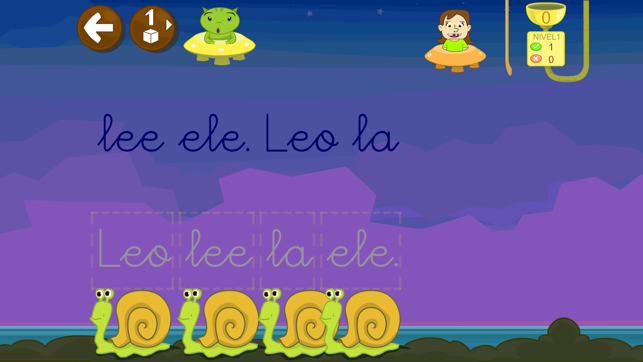 SNAILS: Formation of sentences from words. New options in the games. 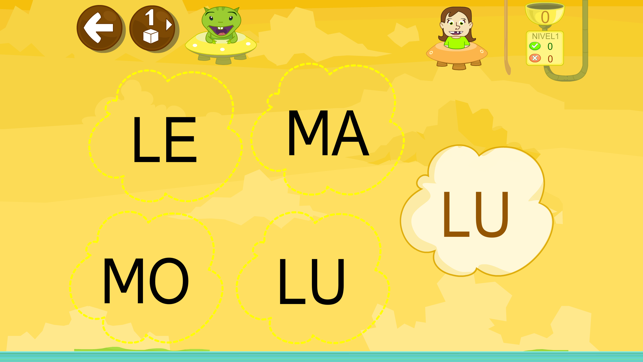 Write and type the letters improved. Most effective reading and writing method.